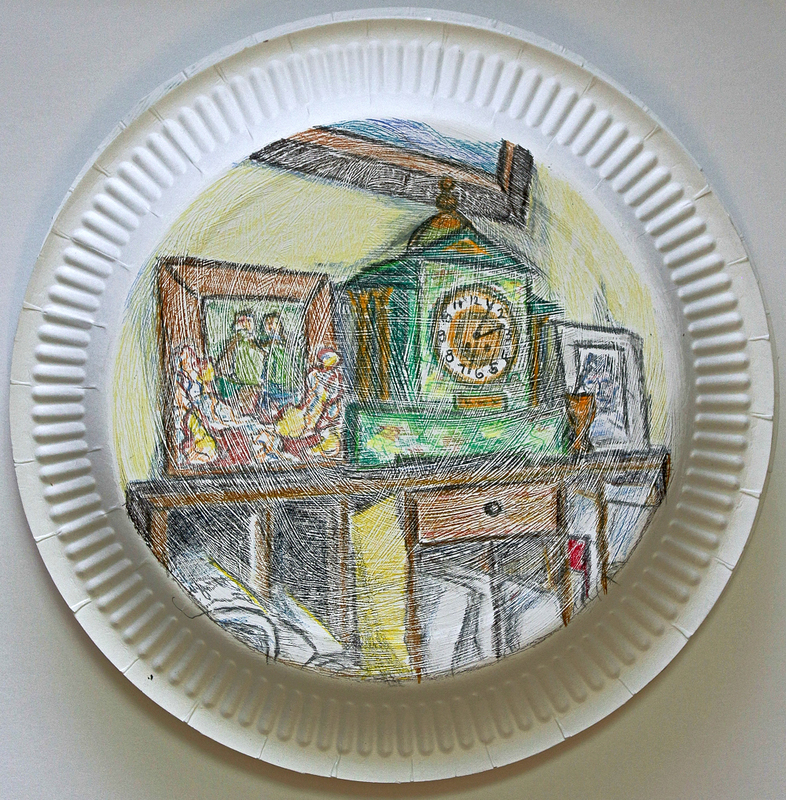 Make a series of three circular pencil drawings, using coloured pencils, of a scene in your house. Choose from the list provided, or something different. Any size, any surface. 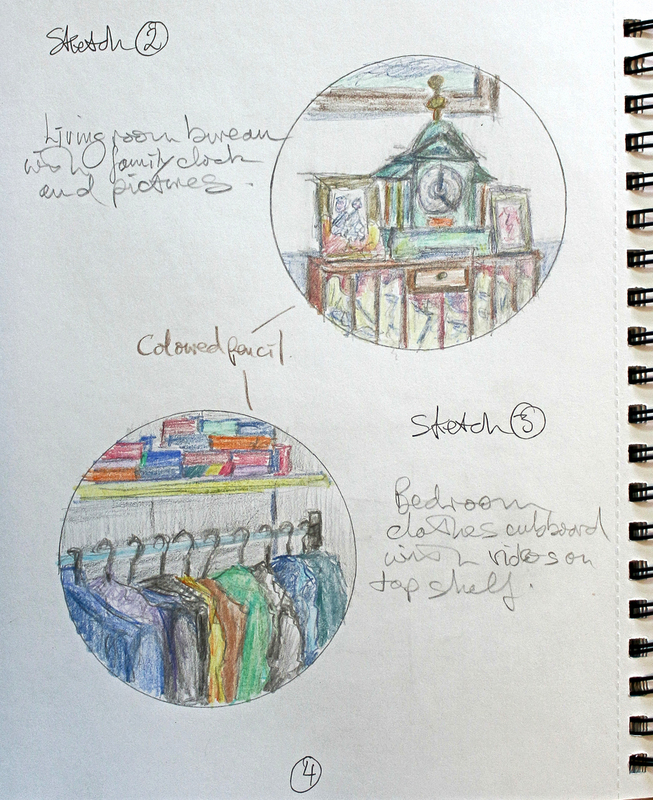 I made three sketches prior to completing the final drawings – these can be found here. For these drawings I used Faber-Castell Polychromos coloured pencils. Drawing on top of the gessoed surface resulted in some interesting mark making. 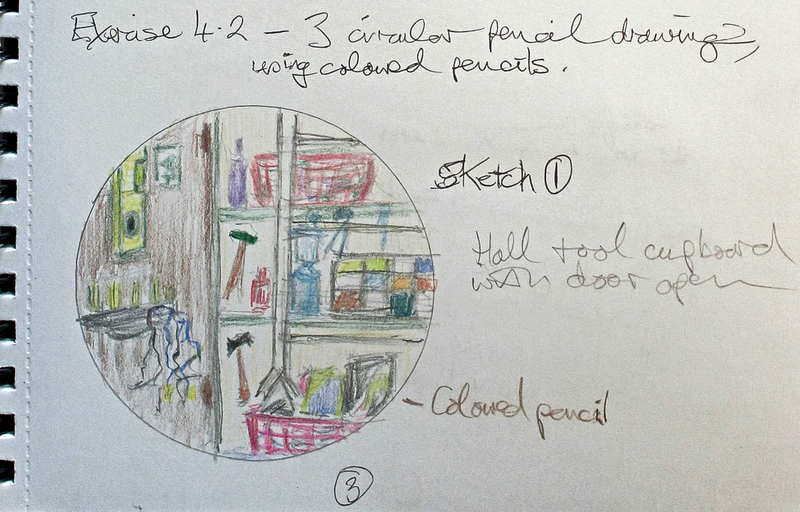 I’m not sure I really recognise this tool cupboard – it’s usually not this tidy! 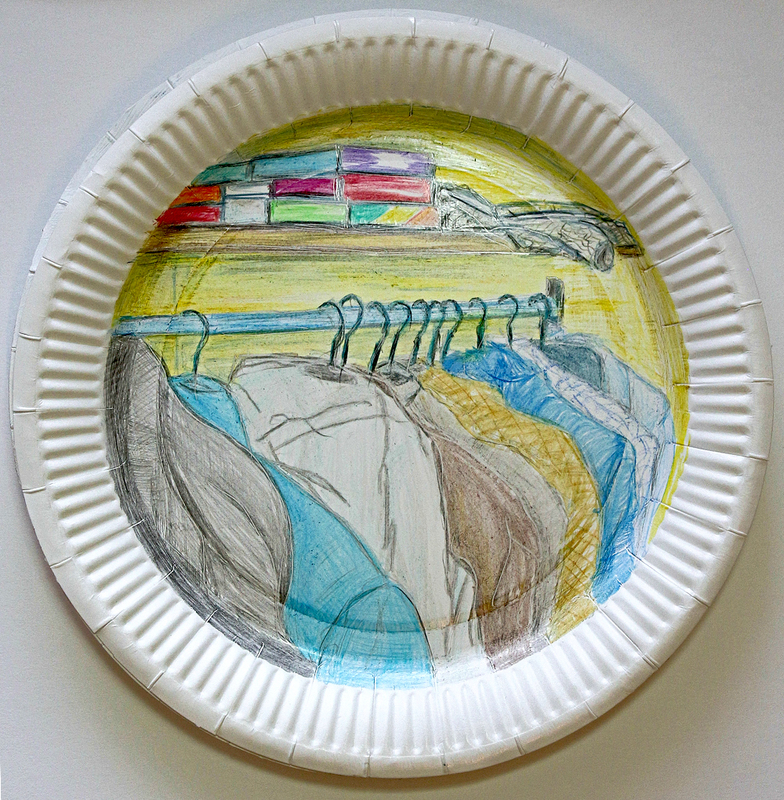 Reversing the paper plate had the effect of presenting the image forward towards the viewer, rather than inviting the viewer in. Again, drawing on top of the gessoed plate produced interesting results – like unintended swirls of time passing across the bureau letters, the photographs in their frames and the clock which was presented to my paternal grandfather by his fellow workers in the Cathkin Laundry in Rutherglen as a mark of their regard on the occasion of his marriage in 1907. 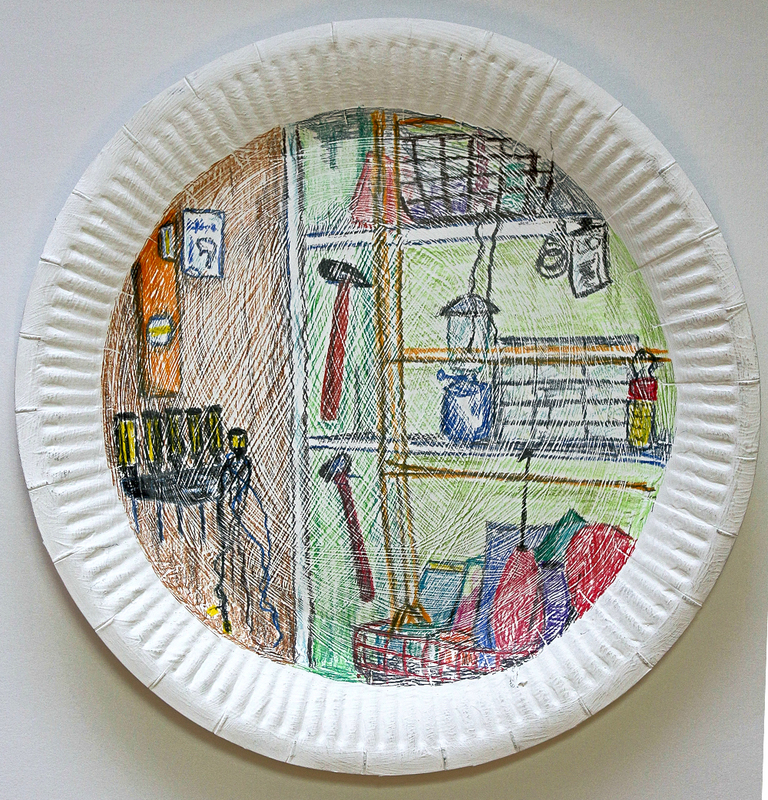 I didn’t gesso this paper plate and found that the pencil was a bit more difficult to apply to the waxiness of the plate itself. The overall effect seems fresher though. It maybe even comes a bit closer to something I wrote in my research notes for Part 4 “Verran’s use of delicate lines may also help with my colour pencil drawings for Exercise 4.2”.